Planing for retreat from an eroding coastline is expensive, it represents loss of the most elemental and permanent kind and nobody wants to think about it, even after it’s too late to do anything else. But on the Vineyard and across Cape Cod, coastal scientists and engineers say the time to plan has arrived. Property owners all around the Vineyard are beginning to sense that no matter what sort of seawall they build or repair in front of a bluff, or how much sand they lay down to nourish a beach, they cannot finally stop the loss of land between them and the rising sea. And towns are grappling with the fact that they can no longer count on the tens of millions of dollars it would take to shore up a road when the bank below it faults and slides too much to fix. Or save a parking lot after the Atlantic begins to break it up and carry it off in chunks. For these landowners and villages, experts say the time has come to identify the places they will back up to if they can, find the money to pay for it where they might and actually move before the things they care about are lost. Bulkheads and jetties have armored specific areas, but deprived downshore areas of sediment. Ms. Fields said with the loss of homes on Plum Island this winter, and the gargantuan effort to move the Richard and Jennifer Schifter home just 275 feet inland from an eroding embankment on Chappaquiddick earlier this year, the outlook of some buyers along the shoreline is beginning to change. “We have had a number of phone calls and inquiries and new jobs from clients on the Vineyard who want to be responsible in planning for their future projects,” she said. The discussion sometimes turns on the longevity, movability and environmental impact of a new home — what are its prospects over the next generation or two or three? For towns, however, it can be almost impossible to think about abandoning a road, moving a parking lot or building new causeways or bypasses before these things are lost. Steve Ewing of Aquamarine Dock Builders of Edgartown, who has built piers and armored private properties against erosion all around the Island since 1978, has also served on town committees that have attempted to look ahead as the ocean rises. Parking lot at Squibnocket Beach in Chilmark has been heavily damaged by erosoion and storm surge. These committees work hard and try to think imaginatively about the future, but he conceded the obstacles before them: There are more immediate problems to worry about, the groups are sometimes staffed by volunteers, often meet at the end of the day “and everybody wants to get home at night,” Mr. Ewing said. But Vineyarders long ago began to build structures to protect things they care about along the waterfront — harbors, oceanside parks, roads — and Mr. Ewing said he believes passionately that the Island should keep those commitments for as long as it can. And he bats away any thought to address the problems of erosion town by town. Establish an all-Island committee, he said. Inventory every jetty, groin and seawall ever built around the Vineyard to hold the shoreline in place. Collect data on how well these structures are working today. Create a computer program that forecasts what might happen as you add, modify or even remove each of those structures. 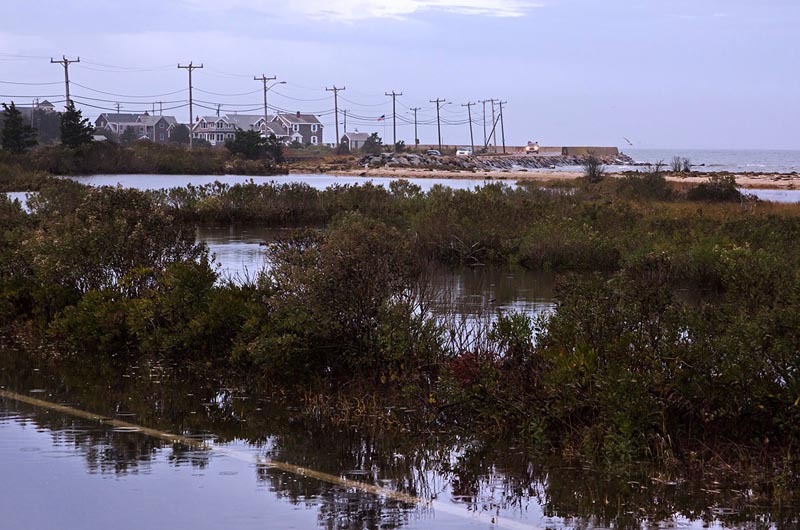 Steve McKenna, the Cape and Islands regional coordinator for the state agency known as Coastal Zone Management, said planning should try to take a look ahead: towns might try to persuade voters to buy a nearby parking lot, for example, before an existing one is lost to the ocean. “Get people [used to] the idea that we do have to take some steps, and [have] people at town meeting raising their hands for moneys for these types of things,” he said. But Greg Berman, a coastal processes specialist at the Woods Hole Sea Grant and Cape Cod Cooperative Extension, doubts this will ever happen. “I keep thinking of sewering and watering on the Cape,” he said. “Anything that adds a penny to your tax bill gets destroyed.” Mr. Berman said he believes it is up to the town officials to identify where roads and lots might move before a storm carries off the old ones and be ready to enact a plan after the storm occurs. Wetlands must be allowed to retreat as shoreline moves inward. As an outpost on the Atlantic, the Vineyard is especially vulnerable to erosion, but visionary steps taken long ago will make planning a retreat from vulnerable parts of the shoreline somewhat easier, said Jo-Ann Taylor, the coastal planner for the Martha’s Vineyard Commission. “We’ve had the coastal districts since the 1970s,” she said, referring to the Islandwide districts of critical planning concern, special overlay planning districts with extra regulations for environmental protection. Those heavily regulated districts have kept hotels, condominiums, malls, and sometimes waterfront homes away from the Island’s most vulnerable coastlines. She wants to organize meetings with selectmen, town highway departments, conservation commissions and citizens to discuss where and how to begin to back away from an eroding coastline. Piers, beaches, bridges and waterfront business districts are also on the list of immediate concerns.